Following last weeks boring (but practical) black I needed to inject some colour back into my life. I keep putting my hand into the pile of fabric that is breeding and insisting what I pull out of it gets sewn before anything else. 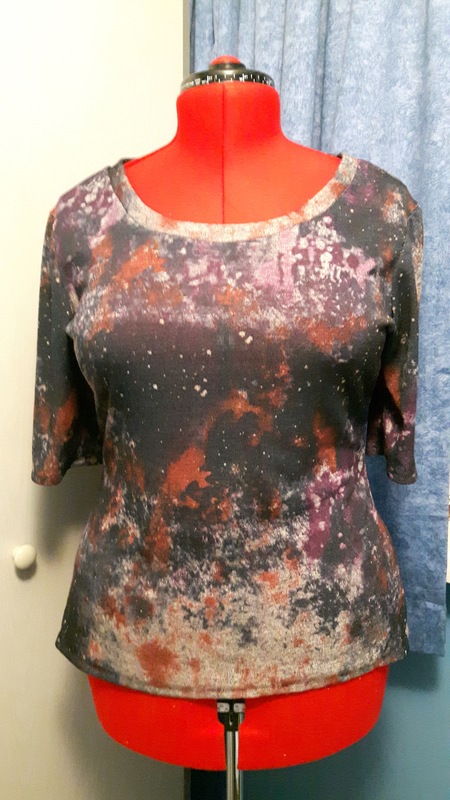 Tuesday’s treasure was a very thin galaxy jersey I bought on eBay April 2014 for £4.98. Bargain!! There was only just enough to squeeze out a TATB Agnes. It’s a bit psychedelic and hasn’t come out well in the photo but you can just seen Christine’s inner workings so you can see its thin. Another 1m out of the stash though. Because I had sewn stash my next make gets to be a new buy. This was a Girl Charlee Sangria Bird Sweater knit in a lovely rich berry pink. My photo doesn’t do it justice. I bought 1m for £9.45. It’s described as ‘light to medium weight perfect for tops, cardigans and cover ups’. The edges when cut drop little loops but it’s not fraying. I should have probably overlocked but I ended up just sewing zig zag and that’s worked out fine. 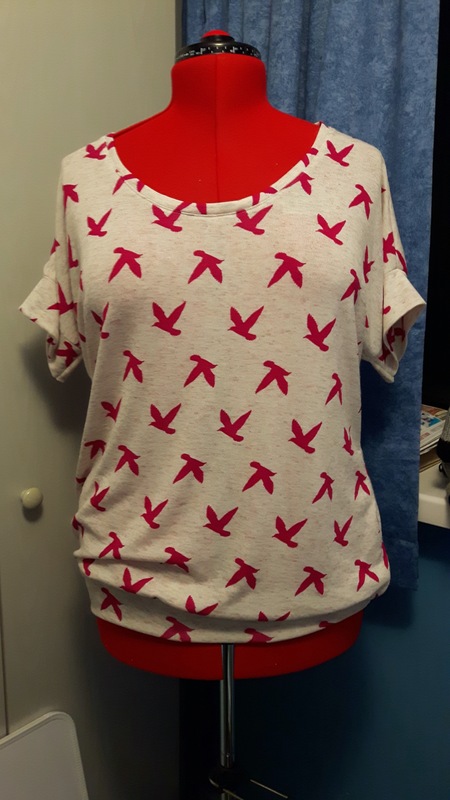 For a pattern I chose the Olivia Oversize Tee from Maria Denmark in size large, described as super relaxed and easy to sew. Perfect match. I had to do the neck twice as usual but it unpicked ok and I think it looks better now. I can see this with capris, jeans or shorts. The last item I finished this week was a UFO I found under the desk (the box of shame). Another jersey eBay, another Agnes. I think this was the second I did and remember being really disappointed. Now I realise it was not a fabric fail but just miss matched. White dots on pink very lightweight jersey. Another very cold snap in Yorkshire meant I needed more pyjamas. I had some where I didn’t like the top but the red bottoms were fine. 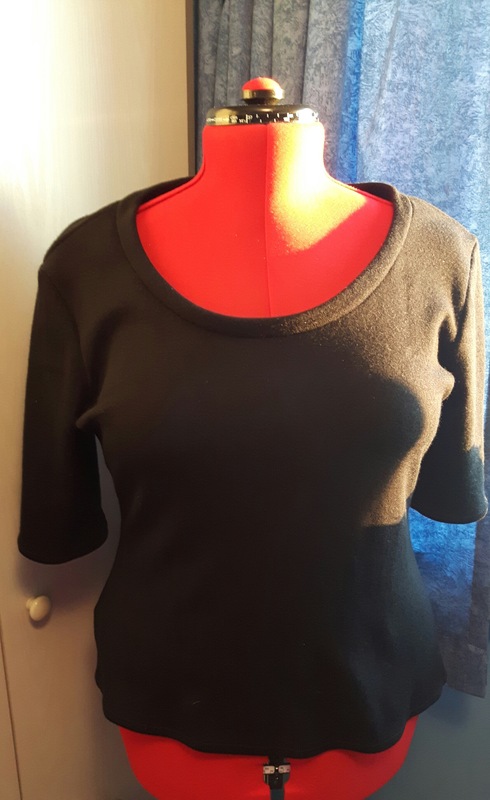 Another practice neckline and a bit of finishing off and I had a another pair and another 1m ticked off as finished. Result. The top photo is a teeshirt I received through the post this week from Redbubble. 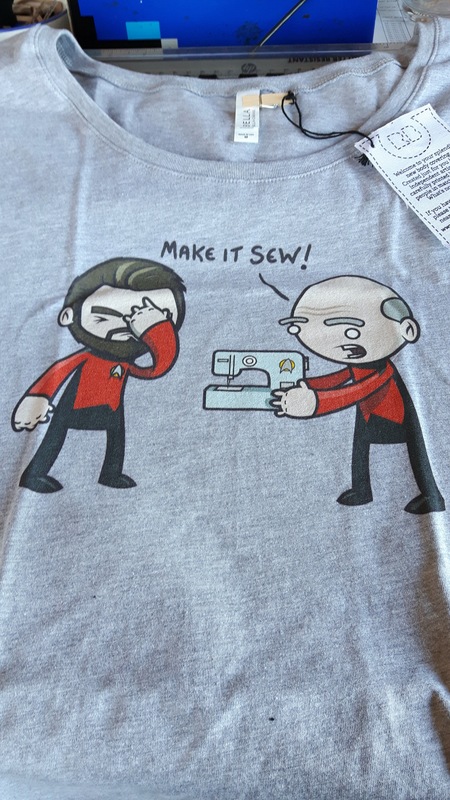 As a sewing Trekie I couldn’t resist. I get dafter as I get older but hey, life is too short. So all in all a good sewing week. Aim of this next week is to try some of the stitches on my new Bernina and crack on with my Dewsbury fabric makes. One of the reasons for sewing was to try and control adding a little bit of colour into a drab world. 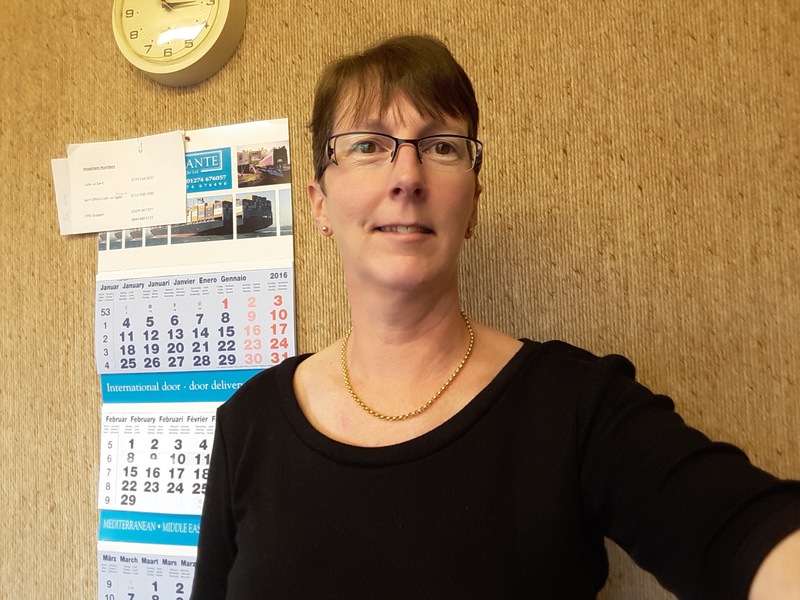 I work in accounts where the men wear suits and I try not to blend in too much with the wallpaper. Very difficult (see the last photo) BUT we all need practical clothing that’s useful ie black. 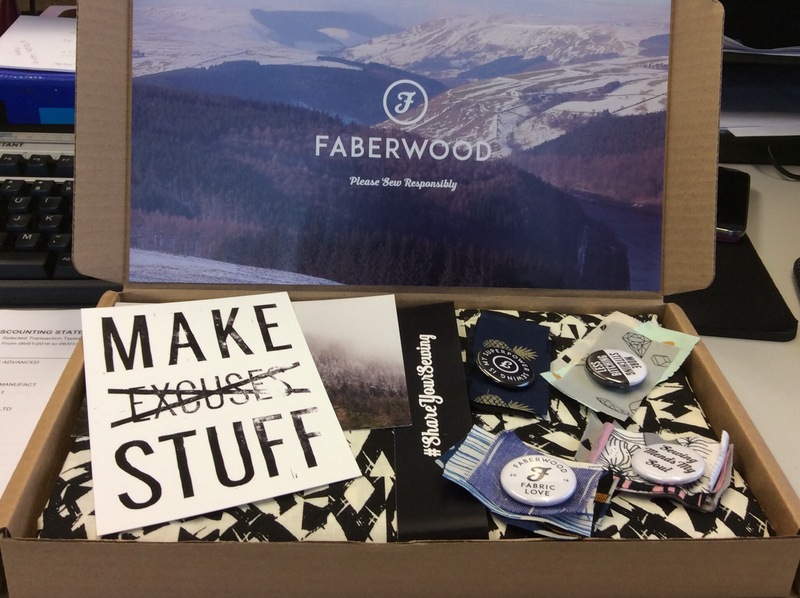 When I found this Swoon fabric from Faberwood I knew it had to join my life and how pleased was I when this goodie box came through the post. Honestly though I didn’t like the feel of the fabric but Fiona did say how to wash it and as a goodie I always do. That’s when it came to life. Once washed and ironed it was lovely and draped perfectly. 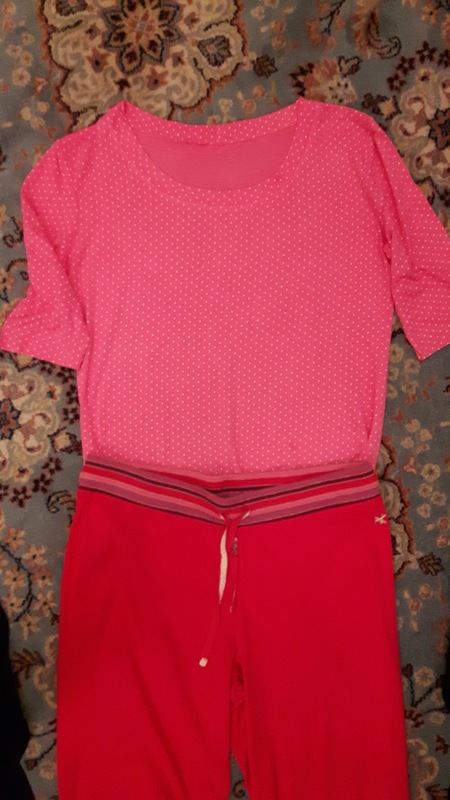 I know it’s winter but I need some holiday/summer clothes and I am trying to sew a mix. I had seen the Luna pants pattern by Made by Rae when they came out and these have become a match made in heaven. I bought 2m and at £7.99 per half metre it wasn’t cheap but I think that shows. The fabric sewed beautifully and as I didn’t want to add bulk I pinked the inside edges. 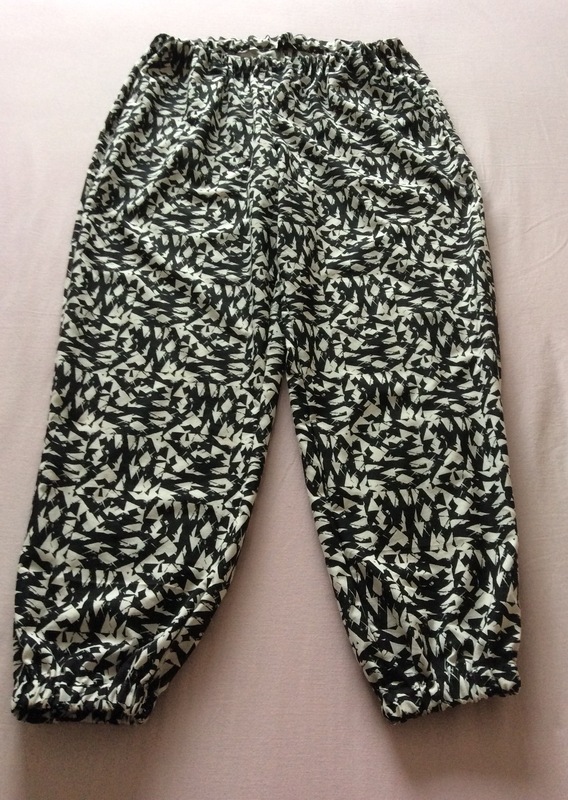 The pants have large pockets but the top inside is caught into the waistband so this holds them nice and flat. 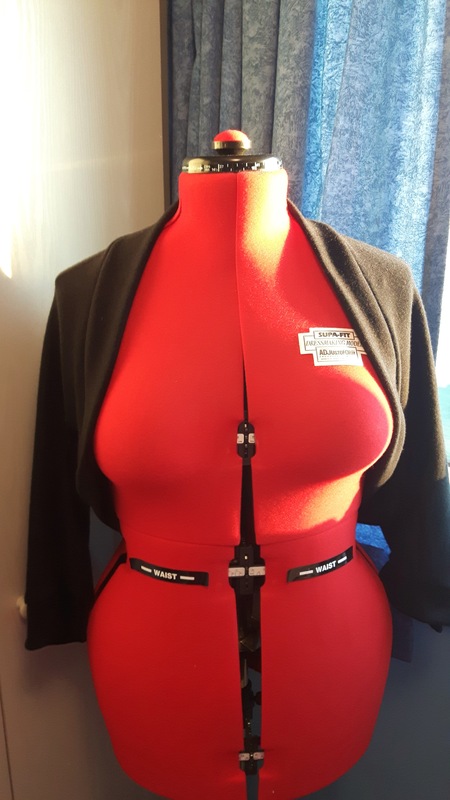 I have inserted the elastic waist but as I won’t be wearing them yet I have left the safety pin in (hoping the running mileage will increase soon and loose a bit of tub). The next black is a stunning merino that I bought last year from Kitschy Coo. First mistake was to cut out on the living room floor!! It’s distorted the fabric and it shows in the result. Hey ho wavy hem I am talking to you. Second mistake being so proud of my twin needling but not putting on the walking foot. Duh they do work together. Again I bought 2m at £10 per half metre and was determined to get two articles out of the length. I cut another TATB Agnes (no 6?) and a Wendy Ward Brightside Shrug ever practical. The shrug is so easy to put together. I tested a scrap on my overlocker and it was wavy but with the diff at 1.5 it went through perfectly. I had had to cut the shrug with a seam up the back to get it all on but you wouldn’t know. This is perfect for work when the heating goes off and we freeze upstairs. I will also make some in brighter colours for summer. Don’t cut sweater knit on carpet. Don’t forget the walking foot on hems. Black has a place in the wardrobe just be selective and not too much. Colour will resume next week. Yesterday I met up with the Yorkshire Spoolettes. A lovely bunch of ladies all with blogs (mostly) and all organised by @akathimberlina. We grouped at a lovely cafe in Dewsbury and then went on to visit the market and then on to some of the best of the fabric shops in West Yorkshire. The first was #fabworksmillshop and my last as I had other commitments. The photo at the top shows my haul on the right. My lovely hubby knew I was missing out and made good time on the M62 so that I could have some time in a little shop we know just outside Molescroft. 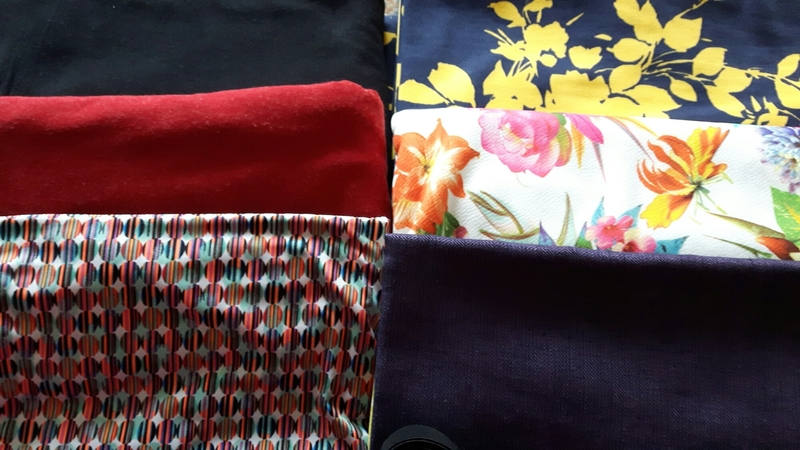 I bagged some lovely drappy viscose and 2 wool, jersey spandex mix. 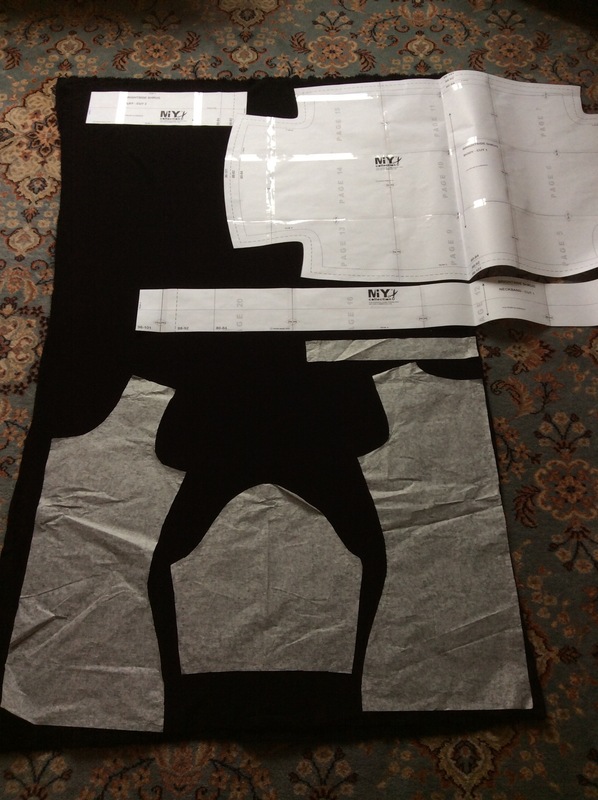 Perfect for my first attempt at a @fehrtrade #tessellatetee. They are the fabrics on the left. The dark ones have been washed and my challenge from Ali is to get my finger out and start blogging. Here starts my journey.